"Sheriff" is Mia's special boy. He is also a half brother to one of our senior herd stallions Flying A Magic's Mr Big Stuff. Mia and Sheriff formed a very special bond right after Sheriff's birth. 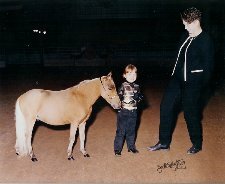 We knew that he should be gelded, so that they could continue to form a friendship and show team to last a lifetime. 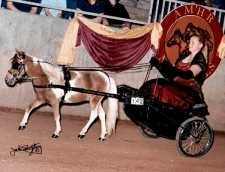 Sheriff is proving himself in the show ring as a fantastic halter horse and Mia's best show ring buddy. We expect wonderful times for this pair in the future. 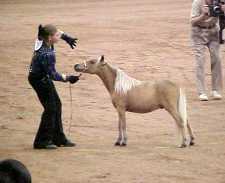 Our thanks go out to Jessica & Kacey of Dreamweaver Farm for their superb handling of Sheriff in the show ring this season. Check out Sherrifs 2004 Nationals accomplishments ! We are honored that this exceptional gelding has been allowed to rejoin our family permanently! His sire, Hidden Meadows Making Black Magic and his Dam, Dennis' May, produced this fantastic little horse in 2000. 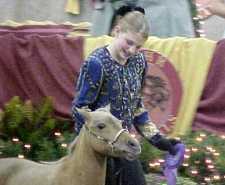 "Desi" is rejoining our family to become Mia's all around show horse. 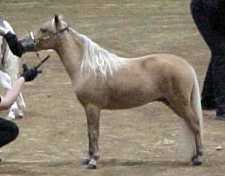 His exceptional personality and patience make him the ideal horse to take Miss Mia to the next step in the show ring. We thank Jamie Sweeney, JMS Miniatures for allowing Mia to benefit from Desi's tutelage and Dana Bryan of Dreamweaver Farm for his exceptional training! Look for them in the ring this season!! !